Custom Flooring Maitland, turn to Ability Wood Flooring. Custom Flooring Maitland brings you more choices of floor coverings – all of which are screened for quality and durability. In our flooring boutique, you don’t have to feel cornered by mass-produced designs. Our wood floor installation company in Maitland expands on current options in the marketplace by providing in-house customizations upon request. Whether you’re visualizing rich creamy hues or dark rustic flooring, we have something for everyone. Think wood-tile-lookalikes, for instance, or European styles of solid hardwood that are distressed to reflect a time-worn feel. Explore some of the most popular collections of floor coverings at Ability Wood Flooring. Wood Flooring Orlando FL – Make your home feel like a luxury retreat year-round with beautiful wood flooring. Choose from solid hardwood flooring that promises to stand the test of time, or, well-made engineered hardwoods that are practical for every corner of the home. Hardwood Flooring – Find sustainable hardwood flooring in various hues and textures. From light to dark shades, we sell natural hardwood flooring that will make your home feel warm and vibrant – day and night. Tile – Ability Wood Flooring features many advances in tile flooring, including customizations that bear a resemblance to other materials, such as wood or stone, for instance. Floor Restorations – When done right, professional floor restorations can dramatically transform a home. We put in the extra effort to make this investment worth it. Sanding & Finishing – When your wood floors have succumbed to daily use, order detailed sanding and finishing services, complete with color and pattern customizations. Divide and conquer your floor renovation project with the help of Ability Wood Flooring. Bathroom Flooring – Oufit your bathroom with custom flooring. From slate floors to engineered hardwoods, and everything in between, our wood floor installation company in Maitland will help you make a concrete decision for the type of floor covering to drop-in to this space. Kitchen Flooring – Design a knockout kitchen with blends of custom flooring. Consult Ability Wood Flooring to bring your vision to life. Decorate your home effortlessly with the help of Ability Wood Flooring. We help you choose the right foundation to build upon. This means timeless and elegant flooring that complements existing furniture, cabinetry, and décor. Our wood floor installation company in Maitland hopes to sweep you off your feet with gorgeous selections that promise to hold up for many years to come. 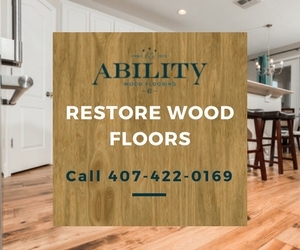 To place an order for Custom Flooring Maitland, head to our store or contact Ability Wood Flooring at (407) 422-0169.